Mr. Methfessel joined Methfessel & Werbel in 1986 and specializes in the defense of liability litigation on behalf of insurance companies and their insureds, as well as third party coverage issues. 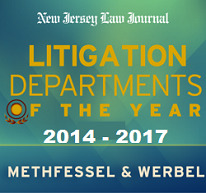 Mr. Methfessel is a member of the Insurance Law Committee of the Defense Research Institute and the New Jersey Defense Association. He is also a member of the New Jersey State Bar Association and its Insurance Law Section. He is a charter member of the Richard J. Hughes American Inn of Court. Mr. Methfessel was recently appointed to the Civil Trial Bar Section of the New Jersey State Bar Association.